I live in a nice quite crescent where most of the neighbours have bird feeders out and are always interested to see what they might intice to the bird table. On a recent visit to our local garden centre I spotted a ornamental robin which sat on a clip so that it could be attached to some tree or plant in the garden. 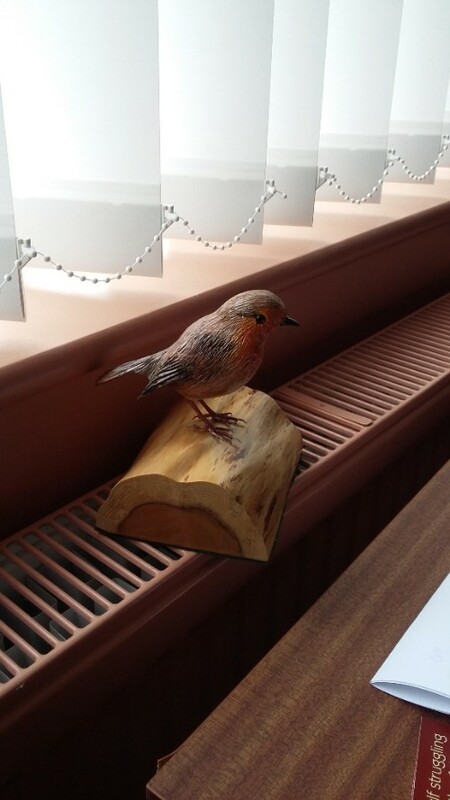 As we in the crescent are all jokers and like to play the occasional prank on each other I decided to purchase one of these robins and attach it to a small pile of logs my neighbour had at the end of his drive. I waited for him to arrive home and watched to see if he had spotted the robin and what his reaction would be. Sure enough he arrived home on time and I could see that he had spotted the stuffed bird right away. His pointing at the bird while talking to his wife told me that they were unsure of what to make of the robin. Was it real, did not quite look right. They sat there in the car for some time and I decided it was time for me to move from my hiding place and head in doors. I did so with a smirk on my face. The next morning I was up early to see if the robin had survived the night, but it had dissappeared. Oh well, it was a laugh for a short while. But before being able to head back in doors, another neighbour close by called me over and said " I think I have a robin on my bird table, but it has not moved all morning", Ah a robin, I wonder. On entering my neighbours back garden I could see the stuffed robin had now found a new home on the bird table. Yes definitely a robin I said to her and quickly backed out of her garden so as not to burst out laughing. I could see what had happened. My neighbour had found the robin to be a stuffed variety and decided to share it's charms with another neighbour. Ok I could appriciate the action. He did not know who had pranked him, but he would happy continue the prank and it would be interesting to see how long it could continue. The next morning I had pretty well forgotten about the stuffed robin and was setting the wood burner up and needed to go out to the log store to bring more timber in, and low and behold what do I spy but a very familiar little stuffed bird sat on my log pile.I let such a loud laugh at the sight of this little robin, which was starting to show some wear and tear from spending a number of nights out in inclement weather, my neighbours wife who had first seen the robin while she was sat in the car with her husband had heard my laughter and out of curiosity peered over the fence. "Whats so funny Joe" she asked. Oh nothing, just a little robin in my wood pile I replied. " You know Joe we had a robin on our wood pile the other night when we returned home, but it has gone now. I do like robins"she ended. I said nothing. Surely her husband knew it was a fake robin but had said nothing to his wife, intending to carry on the little joke. Any way that robin made the rounds of quite a few gardens until it finally fell apart and we all had a good laugh about where it migh next turn up. In a way that little robin still lives on, as my neighbours wife had said how she liked robins I decided to carve one for her so that she would always have one to remind her of the one she saw on their log pile at the end of the drive.